The full announcement can be read here. The long and short: the age requirement for sister missionaries has been lowered from 21 to 19, and the age 19 requirement for boys is now more flexible and can be lowered to 18 (for high school graduates) under appropriate circumstances. There are lot of practical implications that flow from this change, but I want to focus on one thing in particular. It seems strange or maybe a bit silly that at the same time that they equalized things by lowering the age requirement for sisters, they re-unequalized things by lowering it for elders. There’s more at play here, though. First, they technically didn’t lower the official standard age for boys, they just made it easier for boys to go earlier when necessary (the examples of mandatory military services in various parts of the world were specifically invoked in explanation for the change). But it would seem like overkill to lower the sister age to 19 and then emphasize the same potential exemptions. On the one hand, to the extent that military service really is a driving concern behind the 19-to-18 change, it makes sense that Church leaders think of it only as applying to young men. On the other hand, flexibility and possible exceptions are more necessary for boys precisely because boys are still expected to serve, and girls aren’t. That, it seems, is the key. The discrepancy here isn’t really the age requirements. Rather, the difference in age requirements is just a practical consequence of a deeper discrepancy that is still just as present after the announcement as it was before the announcement: we require mission service from young men, whereas it is optional for young women. Don’t get me wrong—I think the 21-to-19 change is a very big deal, mostly because it will, in fact, very likely encourage a much larger number of young women to serve. I really do expect the sister missionary numbers to sharply spike in coming years. But the underlying difference still remains. In this vital, critical, world-preparing work of preaching the gospel and gathering Israel and flooding the earth with the Book of Mormon, we absolutely need as many worthy young men to serve as we can. 1. The amount of young women who serve will go up. This is a good thing. More women trained in church service, less far-too-young marriages. Double win. 2. Boys are going to go at 18. If you can go out of high school, why wait around? So, the overall effect is young missionaries and more women. 3. Given that there is no real need to universalise the 18 policy, my speculation is that they want more women to serve and thus needed to bring the age down. However, they still wanted to maintain the age difference and so the male age was moved as a consequence. Takeaway message: No matter what the church does, some people will still take to the Internets to complain. Fewer child brides, more sister scriptorians. I’m incredibly, incredibly excited about this. Like Ronan, I see less far-too-young marriages as a result of this. Will we see a reduction in divorce rate as a result of this? I also see women in the church now being in more parity with men in terms of their preparation for leadership, and their understanding of church governance. I think this deficit of “inside” knowledge has been a big source of informal inequality in the church. Oh, Becca beat me to it, and much more succinct! Lawrence, it takes a fairly ungenerous reading of my post to see it as taking to the internets to complain. The remaining/new age discrepancy is obvious, and is being discussed. I’m just trying to think a little more seriously about it and what underlies it. There simply is not really much need for circumstance-based exemptions from age requirements if serving is not only totally optional but not really even strongly encouraged. Do you disagree with the substance of something I’ve said here? If not, with respect, your comment seems like a better example of internet-complaining than my post. With young people leaving the Church in relative droves, lowering the mission age has been discussed to get them more involved and committed at an earlier age to stave off their departure. I think that’s a good point, Newt. Also, the non-mandatory nature combines with the shorter term of service to send the message that we value service from young women less. 24 months across the board would have been nice. Amen, Lawrence D. “Lower the age at which women can serve!” they cry. So it is lowered. “Wait! Everything is not *exactly* equal! This is no good!” they cry, still. I think it is a marvelous announcement, and there will much good to come of it. I’m very excited about this announcement. I agree with Ronan’s assessment. It also gives YW more of a purpose as they go through high school–and maybe less lecturing about modesty will ensue at BYU if they are all endowed ;) I am still frustrated, however, sisters can’t serve for 24 months. This was disappointing to me as a missionary, and is disappointing to me now. #11, again, that just doesn’t strike me as a particularly productive contribution to the conversation. World news of the church segment cut off with text “Live press conference will begin shortly.” Looks like they’re doing a press conference, probably about the missionary age? Micheal Purdy, PR person is leading a press conference with Russell M. Nelson and Jeffrey R. Holland, on the topic of missionary service. Elder Holland: “I’m bordering on giddy” with the announcement this morning. MTC time cut by 1/3–even for missionaries learning a language. Reduced time at the MTC. #18, that’s also a pretty huge deal. Being lazy here, instead of reading I’m just asking, are women still serving for 18months or are they bumped up to 2 years? If no change in length of service, what do you suppose the thinking behind that is? Holland is also going to great lengths to express how valuable sister missionary service is. He’s saying that keeping at least some age discrepancy between the sisters and elders is calculated, based on experience, and tends to go better when the sisters are older. I wonder if they’ll change the Personal Progress program to bring it more in line with the Duty to God program now. The DtG program includes lots of practice in the kinds of scripture study, leadership and life skills that make YM successful missionaries. If the YW are going to have the opportunity to become missionaries earlier, it seems they would benefit from some more focused leadership training AND some opportunities to learn about things like visiting teaching before they head off into the mission field and lead discussions. I’m guessing though, 1 year between 18 and 19 year olds isn’t going to be a gap that changes many concerncs. I’m not sure I see the average age of marriage or the number of “young” marriages being affected. Men getting home from their mission up to a full year earlier than before is going to balance things out IMO. And honestly, I don’t think the number of Sister Missionaries serving will spike all that much until they are more encouraged to serve than they are now. Note, I do think there will be an increase, but unfortunately I don’t think it will be all that dramatic. Good question from the Church News. The YW programme is going to have to step up. Isn’t it telling that she’s implying the young women’s program isn’t up to par? Huh. Someone in the press conference just pressed on the issue that priesthood from age 12 and association with adult PH in PH meeting helps prepare YM. But women don’t have church leadership and adult interaction in church to prepare them. Peggy Fletcher Stack asks about going to 24 mo for women. Holland: “One miracle at a time.” !!! Go Peggy. Peggy was great. All-woman freshman year at BYU? Hmmmm. That’s an interesting one. Yes, Peggy’s question and Holland’s answer RE: time of service were a huge deal. He kept the door open there both for equalising lengths of service and even variable lengths of service. My 16 yo is so excited and her FB is lighting up with friends who are planning missions and feel it is more up to themnow instead of waiting to see what happens before they are 21. Think it makes mission for a girl something she can choose and plan, instead of something she can consider later if she hasn’t gotten married. It’s a big deal. Also especially appreciate the whole concept of an age range. It allows the young person the opportunity to consider prayerfully when it is right for them to go. I’d LOVE for that to mean that others would keep their noses out and let the young person decide instead of mounting their campaign as a certain birthday approaches. I also loved that length of service for women is not a closed conversation. It sounds like they jumped at any change and ran! i loved how giddy Elder Holand was! My family lives in an area with very LDS youth. My 17 year old daughter has been looking forward with great anticipation to going to BYU — she is very well qualified (says the proud father with only a speck of bias) — and her first response is that all of her waiting for the chance to finally have a strong LDS peer nucleus has just disappeared, and that her freshman year will not be with a large group of 18 year old boys and girls, but a bunch of 18 year old girls with 21+ year old men, which is an understandable source of disappointment for her. I will be curious to see if boys are encouraged to go at 18 (i.e., forego the one chance that they have to be young and carefree college kids), or whether the pressure will be to go at 18, thus eliminating the phenomenon of LDS college freshman who are really freshman. And Peggy’s questions were great. I know she and Elder Holland are well acquainted and you saw a bit of that in their exchanges. They can say with words “women don’t have a duty” all they want, but this is a game-changer. Mission, not marriage, is the next milestone for young women. Changes EVERYTHING about the YW program. I think this announcement is going to have ripples that are huge in the years to come. My teenage girls almost cried with joy. The looks on their faces were priceless. In the moment, as Pres. Uchtdorf taught, that is all that matters to me today. Marriage no longer is the de facto first goal for many young women in the Church. They now have the exact same opportunities as young men have when it comes to options for life planning as they graduate from high school. I’m still getting chills as I think about that. There could be a number of unintended consequences here and the church may yet tweak this. It is clear to me that this is a policy change 95% about the young women so they will be anxious not to have it spoil the college experience. My life would be totally different than it is now if this had been true in my day. I would have gone on a mission after my freshman year at BYU for sure and not married my husband since that’s when we started dating. My husband feels like he lucked out. I feel a little weird. Ronan: The expansion of missionary opportunities for women is something that is wonderful, and I would not be surprised to see a dramatic increase in the number of our daughters now availing themselves of this life-changing experience. A great thing. Yes, Antonio- I’ve thought about that too. I think the fact that we couldn’t marry the “premies” our freshman year really helped us just date and have fun and not concentrate so much on marriage. Now EVERY guy at BYU is going to be “marry-able”- it will definitely change the flavor of freshman year. That dating and having fun is, in my experience, an essential aspect of the development of our personalities/characters. We tend to be a serious people, and having a season of care-free interactions is something to be valued. Continues chasing after secular values such as “equality” between the sexes along all dimensions will only reduce our birthrate and make us less distinctive, hence more defections. Bad news, I’d say. She has been feeling strongly lately that she needs to prepare to serve a mission. In the temple this week (to do baptisms for the dead), she got an overwhelming impression that she should go on a mission “immediately”. She is barely 20, so she assumed that meant next summer when she turns 21. She was in tears today when she told me she has contacted her Bishop and asked to start the process of leaving “immediately”. All my daughters are happy right now. That’s all that matters in this moment. I’m very pleasantly surprised. Ever since President Hinckley’s talks on not pushing women into missions a decade ago, I’ve thought the church was pretty committed to 21 and the old if-nobody-will-marry-you I-guess-so model. But this definitely sets the stage for 24-month missions for women; I’ll bet we’ll see those in another five or ten years. I agree with Cynthia that this definitely raises the bar for the YW program, and not a moment too soon. I’m cautiously hopeful that we might get more lessons of real spiritual substance and fewer makeover party nights. I this great and serve those that want to serve as missionaries. There is a tiny bit that still cries unfair both in the differences in age and length of service. On the age part I have often thought that there might be social developmental interaction reasons for the age difference. Having women have a little bit more age and maturity development probably serves them well in and equalizing things a little bit. Don’t misinterpret me I think that women are mature enough at the same age to serve as the men. Unfortunately society and even the church disadvantage women in many ways, but giving them a small age advantage perhaps is a small way to bring things a little more equal. Like my little brother who barely missed the school deadline for starting kindergarten. He was so advantaged because of that extra year in physical and cognitive development. It served him well throughout his academic career, through college. It also helped him socially, and didn’t hurt when he played sports either. I did like that in the press conference the door was left open for possibly visiting the equalizing length of service question in the future. Thank you Ray and Ray’s daughter for sharing. I’m hearing so many stories like this over social media. What a great day!! We’ll see but I really got the sense that they just figured they’d hold off for the numbers shake out with this one change before doing that change but it almost seems like a foregone conclusion So much will change and even things like facilities (MTC and BYU) need re-tooling, they mentioned needing to open whole new missions, …. I think they’re thinking lets get through some of those growth bumps, then add the extra months. 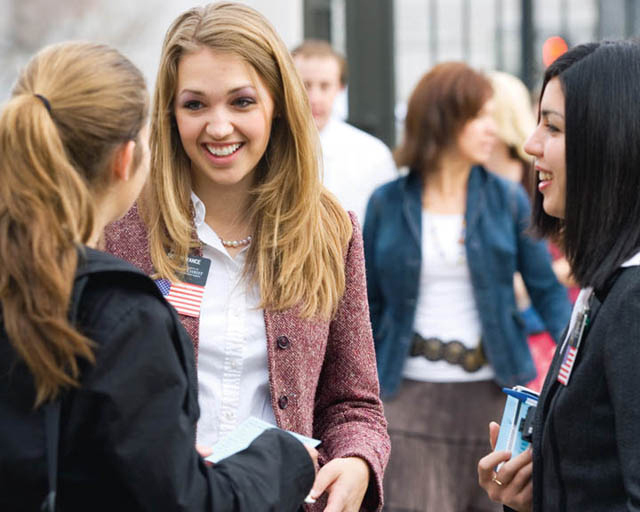 I am curious how many young women in the Church are actually interested in serving a mission. I am sure the number of sister missionaries will spike, but to what extent? What ratio of that to men? Under strict equality, parents will be expected to pressure all children equally and save mission money for not only the boys, but the girls as well. It is interesting to hear so many former sister missionaries lament not having the ability to go at 19-years-old. Admirable perhaps, but I wonder if this type of thinking comes solely because of the luxury that was afforded to them in not being expected by parents and the culture at large to go. Will future young women view the mission in such a liberating, positive light as these former sister missionaries do if the culture at large begins to pressure them into going? They might. Plenty of young men do (or at least say they do). But for all the injustice supposedly done by not expecting women to serve and postponing their service date, it never seems to be mentioned that perhaps it is unjust to expect men to serve and postpone their college education. Very disappointed. Don’t like the idea of missions to begin with and now my two girls will feel additional pressure to devote 18 months of their precious time to the church. It will make it so much harder for them to follow in my footsteps and become doctors. There are only 16-20 years of fertility post-high school and if you want to have a demanding medical career, many of those are spent in school, residency and fellowship. At 32, I am only just now achieving the status of attending and financial pay-off. I will activity discourage my girls early on from considrning a mission. Walker, all I’m hearing all over my social networks are my teen and college age friends who are girls in tears of joy over this announcement. Make of that what you will. Blargh typos and muddled sentences. That’s what I get for commenting quick on my phone before conference started again. Ray: thanks for comment 57. Tears in my eyes. My mom is a YW president who struggles with having more than half the girls become functionally inactive, once they become seniors in high school. Because she teaches at the high school she stays in contact with them, but the ones who go inactive generally are not interested in going to church schools, and most of them don’t go to college at all. She is very excited to have YW be able to stay in their family wards after high school graduation, and have the chance to be involved in the missionary prep program with the YM. Their stake has a huge percentage of their YM go on missions (between 65-80% depending on the year) of young men who are ordained priests. Combined with the new teaching materials and the increased opportunities for YW leaders to tailor programs to their girls, she is thrilled. As the mother who taught me feminist ideals, I wasn’t sure how she was going to be able to survive being YWs president. I had always assumed she was never called to serve there because of them. When she got the call almost a year ago, her mantra became, I can change all the bad things taught to my daughters. After the excited, extremely fast and energetic phone call I got as soon as the session ended, I would say that the is the perfect YWs president to help with the huge transition that is coming with the new manuals and focuses that they bring. I hope that during this transition that lots of my fMh sisters will receive callings in YW to help change the program to a better place than it has been! I am from a family with four girls. I think we all would have gone in missions at 19. By 21 we were all married. I am so glad my daughters won’t have to wait! What Cynthia said. There are many tears of joy being shed right now. So many women want to go. In other words, *your* teen and college age friends on *your* social networks are happy about the announcement. Does this mean they will serve? I don’t know them, so I cannot really tell. But this doesn’t exactly provide a viable statistic regarding how many young women actually want to go on a mission. But even if the number was high, is this only because they are not expected to? In other words, does the “otherness” of the male-dominated mission field attract would-be sister missionaries more than the actual mission itself? Would this attraction change if equal cultural pressure was applied? That’s what I’m really asking: would equal cultural pressure change the way young women perceive the mission? Just so we are all clear: I’m for the age change and I’m for women serving 2 years. I never really understood the 21-yr.-old requirement or the shortened service time. Frankly, I’ve found the shortened service time especially irritating. I hope I have a Ballardesque hair when I’m 83. #64 Sarah W. I’m sorry you feel serving God to be so inconvenient. I thought the question from the Church News was incredibly inane, as did my wife and my sister-in-law. I felt Elder Holland felt the same way, based on his facial expression and the long pause before he asked the reporter to rephrase her question because he didn’t understand it. On the topic in general, everyone in my family is very excited by this news and look forward to seeing what comes of the announcement. I hope that there is NOT increased pressure for men to leave at 18 (after high school) or for women to go on missions. I don’t think there should be pressure for anyone to serve, period. It should be considered a privilege to serve a mission for the Lord, not a rite of passage to gain acceptance in a cultural group. The equal distribution of cultural pressure begins. I do not think there should be either, but let’s not kid ourselves: the pressure is very real. Just see above. I just mentioned in another blog how this new change still keeps things unequal and people told me that I am seeing a problem were there isn’t. I think that by saying that they lowered the age for men because serving a mission conflicted with college, sports or military service shows us that we don’t seem to care if women face the same type of conflict. What pissed me off the most was the requirement that men finish high school before serving, but women don’t have the same requirement. What that tells me is that the church does not place the same emphasis about worrying about women’s choices of education and career before serving. They care about a man’s schooling and career choice more than they care about that of a woman. The optionality plus reduced time for sister missionaries was pro-natal. The church has just (finally!) released new youth curriculum. Browse away. But of course. I’ve never seen that as a good enough justification for the policy. But that is quite different from not understanding the reasons for it. Touche. I think the assumption is that women will have finished–they are out-of-high-school age. A 19-year-old man would not have the same requirement, they just don’t want boys dropping out to serve a mission. Are you suggesting no one really wants to serve? They only do it of pressure? and assuming women can’t or won’t think outside the culture they are in and make real decisions for their lives? That makes sense I guess. I’ll choose to think that is the case. In my daughter’s case, she was specifically told she was “too attractive” for a proselyting mission or to be sent overseas. (Should she be offended or view that as a compliment??) A client’s daughter faced the exact same discussion. I know others who have as well. Will the age change impact that? Far from it. But are you suggesting that parental and cultural pressure do not play a significant part? If this were true, I’d have to make the same assumption about men, since I would obviously be implying that they cannot think outside the culture they are in and make real decisions for their lives. Good thing I’m not making that assumption. I’m simply saying that cultural pressure plays an important part. And it seems to be missing from discussions about mission-based gender equality. Cultural pressure undeniably plays a part, however it seems you are severely downplaying the fact that lots of women really do want to serve–gender inequalities notwithstanding. What the hell? To beautiful to serve a mission? What a load of crap. I’m certainly not trying to downplay anything. Forgive me if that is how it seems. I believe most who serve are genuine, both men and women. But I’m trying to engage the topic of gender inequality when it comes to missionary service. While you and others emphasize the strong desire of many young LDS women to serve missions, I’m trying to point out something that is not simply downplayed, but completely ignored in the discussion. Do you really think the current Church culture (including the unequal distribution of pressure and emphasis) does not create different outlooks for young men and women? While pure spiritual motivations may be all you see in the desires of young LDS women to serve, could it not also partially be the attraction to the “otherness” of the mission that I mentioned above? Of being different and independent in the LDS community (given that women who served missions are considerably less than those who did not)? I’m wondering if that same attraction would be there if it became an expectation of all young women. As a woman who served a mission, I never encountered that. I suspect your keen interest in that, hardly existent, dynamic is because of your gender. Although there may be some women who are influenced in that way, I think your suspicions are mostly just that. Perhaps not. But perhaps you weren’t even aware of it. Perhaps. But I can at least admit that parental and cultural pressure had to have some influence on my decision to go. I doubt I would draw some of these conclusions if I hadn’t had my gender-based experience. The difference, however, is that my gender is expected to go and yours is not (at least not yet). I’m sure that creates different ways of viewing the mission. I’m wondering what effects an increased expectation of young women to serve would have on their outlook of the mission. Of course they are merely suspicions. When did I ever state them as facts? I grew up in a house with four sisters (no brothers). My oldest sister served a mission to England after attending BYU. It was out of the blue, much like my sister-in-law’s decision to go on a mission. I’m merely requesting that when we talk about gender inequality regarding missionary work that we consider the unequal distribution of parental and cultural expectations and pressure. Such things often have subtle, often unrecognized impact. It was fun watching my 17-year-old as she processed the news. She has been planning on serving a mission anyway, and it was fascinating to see the wheels turn as she rethought her plan for the next few years. I think this is a great change. I look forward to seeing the effects it has on missionary work and on the YW program. Sad to see this stone cast. Women physicians have a remarkable opportunity to serve God in bringing positive physical and mental health to God’s children–to those who are blessed and to those who are underserved, in the setting of being employed or as a volunteer. Just as is the case with Sister missionaries, they have the opportunity to reach a vulnerable person in a way that a doctor of the opposite gender is not able. Like a missionary, that path in life requires a great personal sacrifice. While I would not actively discourage my children from listening for a call that they can receive without bias on trying to make my personal choices the ones that they make, I want my children to be prepared for a mission–even if that is not the answer for them in their life. I’m just grateful now that the missionary opportunities for my sons and my daughters are, essentially, equal now. Irony alarm going off re: Sarah W. Are you trying to foster independent judgment and empower your daughters? Does that have anything to do with your personal plans for them to become doctors? Commanding them not to go on missions, rather than fostering their ability to make informed and inspired personal decisions about their own lives, is probably not the way to empower them. My .02. Ray, my 18 year old daughter has also been getting impressions for months that she needs to prepare to serve a mission; these have confused her but today there is clarity. love those comments about girls being prepared with impressions to serve! how wonderful. For those girls that do choose to serve, check out http://www.sistermissionaryclothes.com for some modest and affordable options. Perhaps it isn’t a “hardly existent dynamic” conjured up by my unfortunate luck of being born a Mormon boy. 1) Absolutely – and this new policy can change that to a degree. 2) Sure – for some, but certainly not for lots of others for whom it really is “pure spiritual motivation”. 3) re: “I’m wondering . . .” – Probably not for some, but I’ll take the increased opportunity and the other probable changes over some people losing a less ideal motivation – any day. I just can’t find a way to view this negatively, especially in the aggregate. WalkerW – I think that there will be increased cultural expectation of girls going on missions. It might make a few less likely to go, but more young women more likely to go. I think also the age change makes a mission for a guy a little less automatic at a certain age. Most young men turn 18 during high school so they can’t drop everything and go. So there is less of an alarm clock blarring to make the decision at an exact moment, so while it means fewer boys get “lost” while waiting for 19, it also means that more young men might be more prayerful in choosing the timing and therefore those whose circumstances make it harder for them to go feel just a tad less societal pressure or ostracizism when they feel they can’t go. I have learned from many experiences not to question what the prophets and apostles do. They always see implications that my own logic does not. That being said, I am surprised no one has brought up (as far as I can tell after skimming the comments) the possible reason of male worthiness. I personally know several young men who did not serve missions because they messed up during the year of “drifting” after high school before their 19th birthday. This is a wonderful decision that will help young people keep away from a lot of trouble. As far as pressure: I was not allowed to get my drivers license until I finished the requirements for Eagle Scout. I knew it would end up being a good thing for me to do, but I honestly didn’t have a ton of motivation to do it, other than those car keys. I am so grateful for my parents’ “pressure” and “expectations” because I would not have accomplished that had it not been for them. I likewise will never in my life complain about feeling some pressure to serve a mission. With all the blessings I have received because of the gospel it was the very least I could do. #74 My interpretation of the Church New’s question-in-a-statement was, “Sisters who choose to serve missions at 19 will no longer experience working shoulder-to-shoulder with the sisters in the Relief Society prior to their missions whereas the brothers in YM do work with the older men prior to their mission. Will that impact the sister’s ability to serve having not known the workings of the Relief Society first hand?” It’s not really an inane question because it emphasizes that a young sister may be fairly ignorant as to the organization, funciton, purpose, and sisterhood of the Relief Society. The answer did not answer the question and rather emphasized how young returned missionary sisters will benefit the Relief Society (true). The response that sisters will have hand a year of Relief Society prior to their missions isn’t necessarily accurate; girls who are born in the Fall may be eligible to serve missions within months of graduating from High school rather than a full year away. I just don’t see the dynamic Rosalynde sets up (neat girl vs sweet girl) anywhere but in Rosalynde’s writing. #74, 105, The weirdest thing about that question is lets just say that YW had years of experience going to RS lessons, would that teach them anything about how the church works? Learning how priesthood governance structure could be important to a mission because priesthood governance structure is the church governance structure. To the extent that missionaries should understand the inner workings of the organization they are working for, learning about priesthood could serve that end. Learning everything there is to learn about RS doesn’t do the same for girls, even assuming they spend time in it. I will say that being RS President (in a normal geographic ward, not as much in a single student ward) would be *great* prep for a mission, and mission would be great prep for RS President. In both, you deal with many people who are financially, emotionally, socially, health-wise holding on by a very thin thread. There’s a COPS kind of grit to life that you are exposed to in both jobs–and a need for deep love and empathy and care for people in those situations. But 5 years in RS Sunday meetings does not that kind of experience make. Really it is limited almost solely to the RS President herself. One place where I thought the Church News question was very relevant was regarding home and visiting teaching. Ideally young men can learn a great deal that would be useful in missionary work while they are home teaching. Young women have nothing like that until they get to Relief Society. Been camping this weekend with the non-LDS boy scouts and missed all the excitement. I am hopeful that this announcement will result in more sister missionaries serving and that it will energize those YW programs currently in the doledrums. I also expect it will change the dynamics of the LDS mission experience in fundamental and not obvious ways, through the LAW OF UNINTENDED CONSEQUENCES. It has been almost 40 years since I served and it was a great experience for me. But what I see the missionaries experiencing in my ward today is not something I would want to do myself, to say the least. I forsee the future “God’s army” having slightly younger male missionaries (obviously), and closer to parity in numbers of each gender. Don’t kid yourself, this will result in far MORE SEXUAL ENERGY/TENSION. This will be generally projected in other directions (since I doubt that missionaries openly dating will be allowed or encouraged any time soon). I think a full-time mission might become more attractive to guys if they expect to be working with more ladies and the kind of ladies that they might want to marry. Hence, I forsee the greatly increased number of women on missions attracting more guys onto missions who probably would not have gone other wise. Which summer Bible camp do you think older teenagers prefer; the one with a 90% male / 10% female split or the one with a 55% male / 45% female split? Many guys are not yet 18 at high school graduation. If the average age of guys leaving on missions is 18.5 and they serve 24 months, that is exactly the same age as women who leave at age 19 and serve 18 months. Both will be an average of 20.5 years old when they return, ripe for courtship and marriage. Consider the additional advantage to the young man who hesitates, who waits a year or two before making the sacrifice to serve a mission. The sister missionaries will be the perfect age for him. I think one of the subtle changes is that a mission will serve as sort of a dating service (happy wife hunting grounds) for many more Mormons to marry younger. Although not official dates, the misionaries will interact with each other across gendeer lines in intense experiences that will lower future dating barriers and help with dating skills. I see this as a potential partial solution to the “singles problem.” I hope this does not rebound with a spike in LDS divorces in about a decade from too many marrriages at too young of an age. I have noticed that middle-age goal-oriented driven men have a much more difficult time ordering larger groups of young women around in comparison to groups of young men.That old drill sargent/football coach routine doesn’t work with modern young women. Many mission presidents are borderline tyrants and I don’t see a missionary force made of 40% young women putting up with it quietly, especially if they can muster the subtle support of many of the young men (minus the few fireballs gunning for position). I hope for a decrease in unrighteous dominion in the mission field at every level and a corresponding decrease of it in marriages. I think this may well change the dynamics of some LDS marriage relationships; those based on extreme Peter Priesthood and Molly Mormon stereotypes. On the down side, I don’t see conversions that stick increasing without fundamental changes within the structure of the ward and its grinding cycles. The revolving door will simply spin faster. The LDS mission experience will remain mostly about the missionary, the most important conversion being yourself and your own spiritual development forged in idealistic pseudo-service. I know of wide agreement on this point among many thinking men currently in my ward in their late 20’s to 40’s at this time and this will not change. I would hope for a change in the direction of far more community service. They really do not have enough productive work for the missionaries already serving at this point and they might have to find something more productive for the possible near doubling of the number of those desiring to serve to do. Huh. I might have actually served a mission if the age requirement had been 19 when I was the age to serve a mission. By the time I was 21 I had no interest in serving a proselytizing mission; at 19 I still would have. I agree with much of your assessment. The sisters have a “civilizing influence” on men in marriage and they will have a “civilizing influence” on mission presidents and elders in the field. I also agree with #109. In an ideal church we would all leap at the chance to serve Christ and our fellow brothers and sisters, even in–maybe especially in–unnoticed, unappreciated ways. Missions are a prestige option. I understand that many people had wonderful experiences on their mission, and want others to experience that. I also understand many (especially women) are excited for greater opportunities for women to serve in a more visible, prestigious way. interesting how connected this idea of prestige and service is connected–comments #5 and #7 explicitly hope that earlier service with discourage some women from marrying. Wow. Really? When did marriage come to be seen as a lesser option, or a comedown? My mother vocally looks down on those who get married “too young”; I have often heard this message from women of a certain age (Boomer generation-ish) that marriage and motherhood is something to be put off; something that one retires to after one has a REAL life, etc. I know my mother’s attitude was a backlash against what she felt was overbearing pressure from church culture of her time that her only worth lay in attracting a husband and bearing children. She says she would have welcomed the chance to go on a mission, not only for opportunities to serve but to also show she was as good as the elders. The world already sends a heavy message that marriage and motherhood are hazards to be avoided or put off, not the opportunities for service and growth and joy that they are. I was a YW in the ’90’s, and felt a lot of pressure to go on a mission and get a degree before even thinking about marriage. Marrying and starting my family young was right for me, but I had little support at church for it. In many wards I’ve lived in in the intermountain west there was sometimes a subtle scorn from sisters for, dividing those who Went from those who Just Got Married. More than once i’ve been asked by an RLM why I didn’t go on a mission, since I seemed to be fairly intelligent and spiritual. Smart, inspired people are exactly the people you want as wives and mothers, and yet are we denigrating these important life missions? I also have noticed a lot of pressure for women to more resemble brethren in their church work outputs, notwithstanding much of rhetoric supporting motherhood at the top. Being a SAHM is demanding (we all know that) but I have received lots of pressure to increase output in my church service, even if it means sacrificing family time with very young children, or even limiting family size. This pressure has come from male leaders and female leaders of a certain bent. I feel the church culture in the trenches is already de facto not supportive enough of marriage or family; I fear this lowered age with be another venue for pressuring sisters to be “more like men” . I think it’d be great if more sisters in the field would gentle the rigorous, one-size-fits-all corporate culture that currently dominates; I fear that the opposite may happen. I’m happy for those who wanted to go; for that this must be a dream come true. I worry about those who will now be told that if this isn’t their dream-come-true, then they need to do some serious repenting. The LDS mission is such a contrasting and dividing experience. Most people would leap at the chance to serve Christ and our fellow brothers and sisters, this is true.The problem is that most people (70%) don’t see an LDS mission as doing that. They see it as something else; perhaps servitude to a rich corporation without any financial renumeration and a dubious increase in social position while missing valuable educational and/or recreational opportunities. Or something akin to military conscription with its regimental overstructure and boredom and risks of social ridicule in place of physical harm. Less than half who don’t go remain active. (ibid) This divides the young men up into three initially nearly equal groups; RM’s, active-but-not-RMs, and “less-active.” After a few years pass a less well described rottenness develops manifested by the moderate bleeding of RM’s going inactive and increasing those ranks. This is harder to demonstrate, with numerous conflicting reports. Which is probably less than the corresponding hemorrhage of active-but-not RMs leaving the fold, particularly when they don’t find a nice LDS girl to marry and get kicked out of the singles ward. This is not a new problem. But with the total number of full-time missionaries stagnating in the upper 50,000 range for many years now, even with the growing portion of senior missionaries from probably <1% to over 10%, the creaping anemic response to the call to serve a mission seems to have reached a tipping point. Many people describe wonderful experiences as a missionary. But here is a darker side to that and few still active want to openly admit it. (For me it was both.) Those who have left the church often paint an ugly picture of their missionary service. Whether this reflects their feelings at the time of their service or is a projection and reinterpretation of those experiences is anybody's guess. I recall that most missionaries tried to pretend otherwise but were depressed or less than happy much of the time and I see it today in the missionaries serving in my ward. We describe this by saying "missions are hard," but when compared to the difficulty of higher education and career they seem like a vacation. -From a purely statistical perspective, does the LDS mission experience solidify commitment in more people than the number of people it divides out and discourages when they don't go? -Will this change add more core Mormons who met their spouses on their missions and are zealous in service and tithing payment at the expense of further weakening the fringes of the church where service is already flaky and tithing collection meager? -Will we continue to preserve the dicotomy; for young men a mission is a responsibility or requirement, for young women it is a choice or an elective. And if not will the young men feel less of an obligation or will the young women begin to feel more of an obligation? – What haunts me in the darker corners of my mind, did our leaders just offer up our young sisters and daughters as "candy" in a seemingly harmless way in order to entice our young men to fulfill their missionary responsibilities? This in place of the more difficult task of restructuring the mission experience at a fundamental level so that it better fits the ideal of genuine service to Christ which would be lept at by more young people?? As a Sister RM, I am very grateful that I only served 18 months as opposed to 2 years. Perhaps as our younger Sister pioneers break the misogynist barriers and attitudes change about Sisters and their service, THEN we can extend service to 24 months. Leaving when I did, honorably, was a sweet mercy.